Imagine a solar panel more efficient than today’s best solar panels, but using 10 000 times less material. This is what EPFL researchers expect given recent findings on these tiny filaments called nanowires. Solar technology integrating nanowires could capture large quantities of light and produce energy with incredible efficiency at a much lower cost. This technology is possibly the future for powering microchips and the basis for a new generation of solar panels. Despite their size, nanowires have tremendous potential for energy production. “These nanowires capture much more light than expected,” says Anna Fontcuberta i Morral about her research, published on 24 March 2013 in Nature Photonics. Nanowires are extremely tiny filaments–in this case able to capture light–with a diameter that measures tens to hundreds of nanometers, where a nanometer is one millionth of a millimeter. These miniscule wires are up to 1000 times smaller than the diameter of human hair, or comparable in diameter to the size of viruses. When equipped with the right electronic properties, the nanowire becomes a tiny solar cell, transforming sunlight into electric current. Anna Fontcuberta i Morral and her team built a nanowire solar cell out of gallium arsenide, a material which is better at converting light into power than silicon. They found that it actually collects more light than the usual flat solar cell–up to 12 times more–and more light means more energy. The nanowire standing vertically essentially acts like a very efficient light funnel. Even though the nanowire is only a few hundred nanometers in diameter, it absorbs light as though it were 12 times bigger. In other words, it has a greater field of vision than expected. Fontcuberta’s prototype is already almost 10% more efficient at transforming light into power than allowed, in theory, for conventional single material solar panels. Furthermore, optimizing the dimensions of the nanowire, improving the quality of the gallium arsenide and using better electrical contacts to extract the current could increase the prototype’s efficiency. 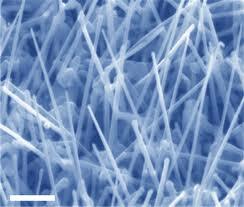 Arrays of nanowire solar cells offer new prospects for energy production. This study suggests that an array of nanowires may attain 33% efficiency, in practice, whereas commercial (flat) solar panels are now only up to 20% efficient. Also, arrays of nanowires would use at least 10 000 times less gallium arsenide, allowing for industrial use of this costly material. Translating this into dollars for gallium arsenide, the cost would only be $10 per square meter instead of $100 000. Free to the engineer’s imagination to mount these nanowires onto a variety of substrate panels, be it lightweight, flexible or designed to withstand the harshest of conditions. In a world where energy consumption is on the rise, these nanowires may one day power everything from your favorite gadget to space missions to Mars. Previous articleCorporate free speech greater than that of human citizens?